A lot of solid and sensible tweaks have made Mixcraft one to seriously consider, and it represents great value for money. Extremely easy to use. Automation and send tracks. Useful new plug-ins. Nicely implemented notation editor. Attention to detail throughout. Video options are limited. Not the most advanced app. No 'big brother' application. 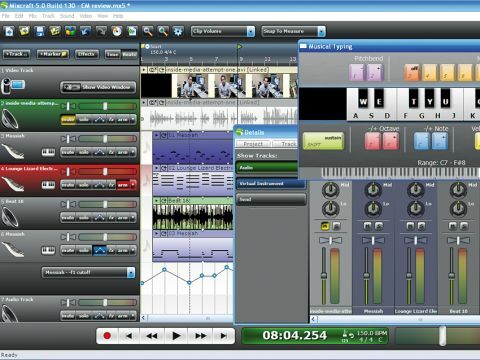 We first encountered Mixcraft in 2005 when it was a gangly teenager of an audio sequencing package that didn't even have basic features such as snap. By the time we caught up with it at version 4, it seemed much more self-assured, delivering MIDI and virtual instrument support and generally starting to feel like a proper DAW. Now we have Mixcraft 5, which, when you take a look at the new features list, looks set to be the release at which the software fully matures. We won't waste too much time dealing with the interface: it's a straight-down-the-line affair and you can probably tell what everything is and does just by looking at the screenshot above. It's worth noting, though, that the Details tab at the bottom - which gives you access to Mixcraft's editing windows and loop library - can now be undocked. 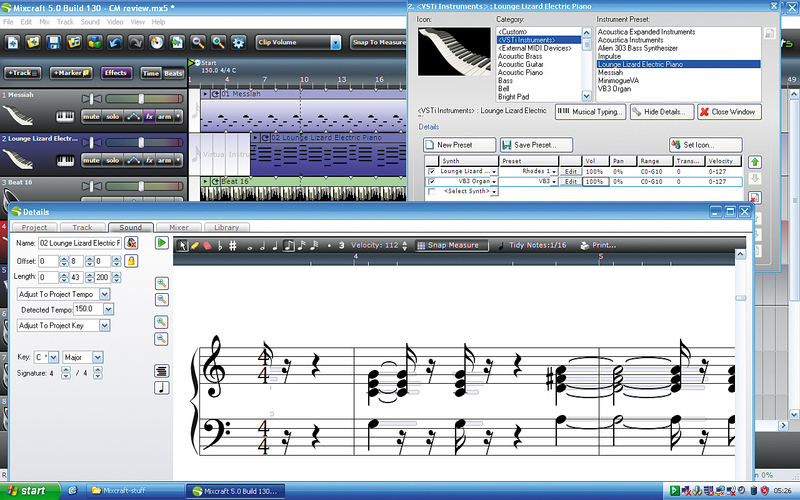 As a result, full-screen MIDI editing is now possible, which is a real boon. You can even drag the whole tab onto a second monitor. Speaking of the MIDI editor, there's a newly added option to switch to a basic notation view, in which notes can be added and moved around. One clever touch is that piano roll-style bars appear behind each note, representing their length. You can then drag the edges of the bar itself to easily adjust the start position or length, which is a lot easier than fumbling with the usual crotchet/quaver/minim tools, especially for those not fully au fait with notation. For those musically inspired moments when you don't have access to a MIDI keyboard, the Musical Typing Keyboard will come in handy. It does exactly what it says, turning your computer's QWERTY keys into musical ones. There's also a new Mixer option to consider in the Details tab - rather than using buttons and sliders below each track name, you can now mix on a virtual mixing console. Each channel offers standard mixer functionality, and includes a useful three-band EQ. Also in the mixer are the new Master and Send tracks. The former facilitates global effects and volume adjustments, while the latter are auxiliary busses that enable you to share effects between multiple tracks (such as reverb - the classic send effect). "Rather than using buttons and sliders below each track name, you can now mix on a virtual mixing console." Further evidence that Acoustica is attempting to turn Mixcraft into a more serious music production tool is provided by the new automation features. Each track now has an automation lane that enables you to adjust effect and instrument parameters over time by clicking and dragging. Smaller details also serve to improve the user experience. Clips can now be linked, making it easy to move or copy specific sections of a track, and the entire contents of a track (the audio, MIDI, effects and automation) can be bounced to a new audio track, should you need to free up some CPU cycles. Speaking of which, you can now monitor CPU usage with a dedicated meter, though with support for multi-processor machines and SSE2 optimisations, you're less likely to run out of horsepower than before. Returning to the visible additions, there's now a video track. AVI and WMV files are supported as standard, and others may be importable depending on the DirectX decoders that you have installed. Editing options are pretty limited - you can move clips around, adjust their start and end points and split them - but it's fine for adding a soundtrack to a home movie (a video's original audio can be unlinked and deleted) and overlapping two videos creates an automatic crossfade. No DAW update would be complete without a selection of new plug-ins, and it's a pleasure to find AAS's ever-playable Lounge Lizard Session in Mixcraft 5's revised line-up of instruments. You can add to this Gunnar Ekoranas' Messiah, a more than serviceable Prophet 5 clone, and the Alien303 Bass Synthesizer, a 'bassline' synth that's more versatile than its name might have you believe. The effects roster has been bolstered by the vintage-style Pultronic Tube EQ (in case you can't tell, it's a Pultec emulation) and Shred Amp Simulator, the latter of which boasts five amp heads, 17 cabs and six effects. It's impossible to use Mixcraft 5 without being reminded of Apple's GarageBand. Although comparisons between the two programs are somewhat meaningless - they are, respectively, PC- and Mac-only - it's interesting to consider their key di­fferences. Mixcraft 5 has taken a lead over GarageBand with the addition of its dedicated mixer and Send tracks. It's also worth noting that, while GarageBand only o­ffers a selection of built-in Apple instruments and e­ffects, Mixcraft's suite of third party plug-ins gives more variety. Its dockable Details tab also makes editing a little easier. GarageBand fans could counter that their software supports Artist Lessons - video tutorials featuring famous musicians. However, their true worth is always going to be limited by your interest in the artist. On a more practical level, GarageBand has a useful multi-take recording feature, and feels a bit slicker overall. "If Acoustica keeps improving Mixcraft at the current rate, its users may not feel like they need to go anywhere else." Arguably the key di­fference, though, is that GarageBand users who outgrow their application can move on to the pro-level Logic Express or Studio DAWs, taking their skills (and project ­files) with them. That said, if Acoustica keeps improving Mixcraft at the current rate, its users may not feel like they need to go anywhere else. We have to admit to being surprised at just how much Acoustica has added to Mixcraft 5, and it's clearly spent plenty of time testing and ironing out bugs (previous versions exhibited annoying glitches when looping, a problem that has been resolved, thankfully). It seems that no element of the program has been left untouched, which is particularly impressive when you consider that this isn't a DAW that has a massive development team behind it. What's more, the vast majority of the new features are extremely useful: you get the feeling that Acoustica really believes in Mixcraft, and wants to push it as its flagship app for the foreseeable future. Most importantly, features haven't been needlessly added at the expense of usability - Mixcraft remains an accessible, affordable and stable application that enables you to make music quickly. Cockos's Reaper may be more capable, but if you're a PC user who wants to make things as easy as possible, Mixcraft is definitely the way to go. A Mixcraft drum loop, bass and lead parts from Messiah, and a Rhodes piano from AAS's Lounge Lizard Session.